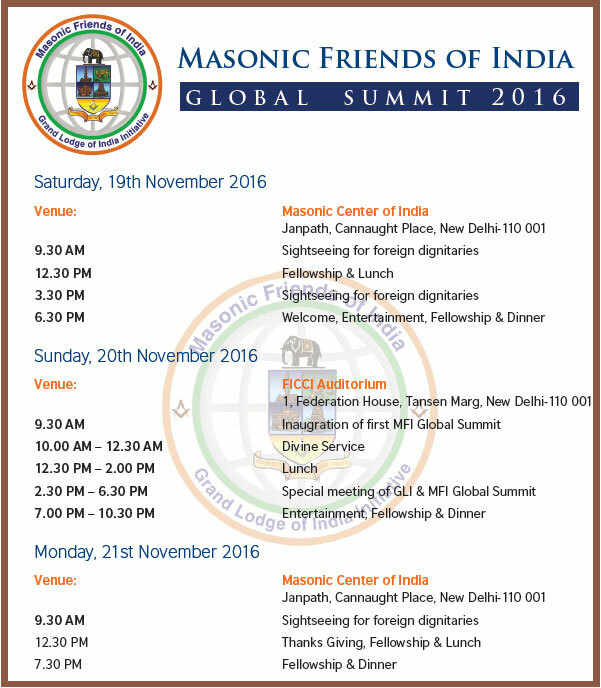 The Grand Lodge of India AF&AM will be hosting a Global Summit of Masonic Friends of India in New Delhi on November 19-21, 2016. There will be plenty of organized sightseeing of historic Delhi, lunches and festive boards, and the program itself on Sunday - all included in the US$200 Foreign Participants registration fee ($300 with your spouse). Click image of program to enlarge. 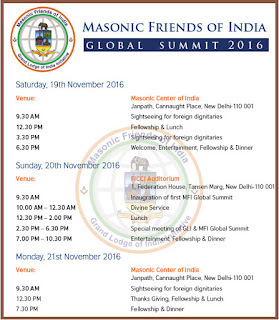 The Glabal Summit of Masonic Friends is at New Delhi. Varanashi is not in New Delhi. It is 794 kilometers away! Incidentally, the Grand Festival of GLI is at Varanashi and that is on 26 and 27 November at the Ancient and Holy City of Varanashi. My apologies. An earlier release about the summit listed a great deal of conflicting information and I am not familiar with Indian geography. So, many thanks for the correction, which i have made to the original post.